Provenance: Almost certainly the personal property of Jean-Henri Riesener (1734-1806), illustrated in his portrait by Antoine Vestier (1740-24), circa 1786, reproduced here in fig. 1. Baron Meyer de Rothschild, probably purchased by him in Paris after the 1848 Revolution. 343 A table, of mahogany and chased or-molu, with three drawers, the top of parqueterie, an oval panel of flowers in coloured woods in the centre. Temp. Louis XVI. Sold as lot 218 from the Property of the Fifth Earl of Rosebery 's Trust Settlement, in these Rooms, 12th June 1992. 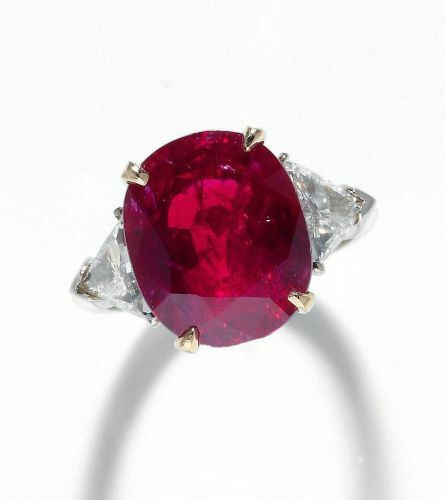 Biennale des Antiquaires, September 1992. G. de Bellaigue, The James A. de Rothschild Collection at Waddesdon Manor Furniture Clocks Gilt Bronzes, Fribourg, 1974, Volume II, no. 103, pp. 504-509, p. 516-519, no. 105. M. I. Pereira Coutinho, 18th Century French Furniture, Lisbon, 1999, no. 23, pp. 223-227. Pierre Verlet, French Royal Furniture, London, 1963, p. 139-140, no. 19, p. 149, no. 22. Amelia Peck, et al., Period Rooms in the Metropolitan Museum of Art, New York, 1996, p. 121. Alexandre Pradère, French Furniture Makers, The Art of the ébéniste from Louis XIV to the Revolution, Tours, 1989, p. 9 and pp. 371-387. Catalogue of the Exhibition, Marie-Antoinette, Galerie Nationale du Grand Palais, Paris, 2008, pp. 157, 167, 214. There exists in the Château de Versailles a tantalising and seminal portrait of the celebrated French ébéniste aged in his early 50's, at the height of his powers and fame, leaning on a table identical to the present one, almost certainly the very same. Pradère, op. cit., p. 9, states that `the ébéniste is depicted holding the pen of a designer of furniture rather than a craftsmen's plane; one senses the desire to affirm his status as an artist....Here is evidence of his obvious ambition to raise himself to the level of the artist'. His exalted status which extended far beyond his profession meant that one of the fashionable artists of the day painted his portrait and what more fitting tribute to his genius can there be than a portrait with him leaning in a relaxed pose, with pen in hand, designs for decoration by his side, his hand outstretched in explanation, on one of his most celebrated pieces-the very same unique writing desk that is being offered here.The fact that the present writing table does not bear Royal inventory marks, despite it being comparable to other models by Riesener made for the Crown, and the fact that no other identical tables are recorded, almost certainly proves the definitive ownership of the table depicted in this portrait of Riesener and demonstrates the pride of the maker in this model. 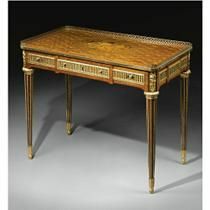 This outstanding writing table of superlative quality represents the pinnacle of Parisian ébénisterie of the latter years of the 18th century and must be considered in the context of the small group of related tables made by Riesener exclusively for the Royal Family between 1775 and 1785, which reached its apogee in the writing table made for Marie-Antoinette, now at Waddesdon, see G. de Bellaigue op. cit., no. 103, pp. 504-509. 2.The mechanical table, circa 1781, from the Cabinets of Marie-Antoinette at Versailles and at Saint-Cloud, now in the Metropolitan Museum of Art, bearing the inventory number 3066, illustrated by Verlet, op. cit., p.132, fig. 19b & c and reproduced her in fig. 3. This mechanical table has a top which moves backwards and forwards and has a mirror on the inner side similar to the table Riesener supplied for the Trianon in 1776, which was lent by the Queen to Gustavus III of Sweden in 1784. It has a trellis ground on the top and identical corner mounts and octagonal legs but has a more elaborately mounted frieze with a central pictorial panel depicting the attributes of Poetry and Literature on the top. 3. The table (together with a secrétaire) delivered on 6th August 1777 for Louis XVI's study at the Petit Trianon, which is now also at Waddesdon, see de Bellaigue, op. cit., no.103, p. 505, (illustrated), reproduced here in fig. 4. This embodies many similar features but also differs to the present table e.g. the three-quarter galleried trellis parquetry top enclosing a marquetry panel depicting trophies emblematic of Poetry and Literature, as opposed to a floral spray on the present table, different frieze mounts, on square tapering as opposed to octagonal legs. 4. The table in the Gulbenkian Museum, Lisbon, circa 1781, illustrated by M. I. Pereira Coutinho, op. cit., no. 23, pp. 223-227, reproduced here in fig. 5. It has a similar top inlaid with a roundel with a floral bouquet on a trellis ground but different mounts and square tapering legs. This latter table, along with a commode and a table en chiffonnière, was supplied to Marie-Antionette for her cabinet de la Reine at the château de Marly in April 1781:- 3075 Une table à écrire assortissante, a deux tiroirs dont 1 garni d'encrier, poudrieret boete a eponge de cuivre argente, avec une tablette a coulisse par devant couverte de velours noir encadre d'un petit galon d'or. La marqueterie composée de compartiments de bois satiné, le dessus a mosaiques avant au milieu un groupe de fleurs, la table ornée de chapiteaux, balustrades et bos reliefs d'enfants, le tout de bronze ciselé et doré d'or moulu. It later was at the Hermitage Museum in St. Petersburg and was purchased from the Soviet Government in 1929. 5. The table now at the Châteaux de Versailles and Trianon (V 5288), which was originally at the Petit Trianon and delivered in 1784 by Riesener, to the Garde-Meuble de la Reine, probably for Madame Elisabeth the sister of Louis XVI or even Marie-Antoinette (V 5288), the top of which is reproduced here in fig. 6. The flowers on the top are almost identical but disposed differently and this table is discussed fully in Revue de Louvre 1990. Jean-Henri Riesener (1734-1806), received Master 1768, ébéniste du roi 1774. The German born Riesener was probably the most important furniture maker of the Louis XVI period. 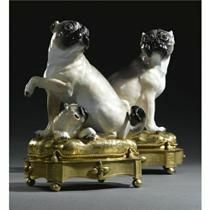 Together with Boulle and Cressent, he was one of the few ébénistes mentioned in 18th century sale catalogues. The finish of the veneer and mounts on his pieces were unsurpassed. He could produce everything in his own workshop including the mounts with the privilege of ébéniste du roi. He became the favourite furniture maker of Marie-Antoinette paricularly after the birth of the Dauphin and almost completely furnished her rooms in Fontainebleau and has been consistently regarded as the greatest cabinet-maker of the Louis XVI period. Riesener moved to Paris at a young age and became apprenticed to Jean-Francois Oeben around 1754 at the Arsenal and took over his workshop in 1765 on the death of Oeben. Not only did he take over the workshop; he married Oeben's widow in 1767 and as a result, he became a member of one of the principal dynasties of ébénistes in Paris at that time, as she was the sister of Roger Vandercruse and the sister-in-law by her first marriage to Simon Oeben and of Martin Carlin who had married one of Oeben's sisters.His first delivery to the Garde-Meuble was on 5th February 1771 and in the following years a number of `bureaux mécaniques' are recorded in the Journal of the Garde-Meuble and he enjoyed great success in the years from 1774-1784 and during these years he delivered more than 938,000 livres worth of furniture to the Garde-Meuble Royal. He was the fourth and youngest son of Nathan Mayer Rothschild (1777–1836). After studying at the University of Leipzig and Heidelberg University, he became the first member of his family to receive an education at an English university, spending time at both Magdalene and Trinity College, Cambridge. He was never very interested in the banking world of his family although he did become High Sheriff of Buckinghamshire in 1847 and was elected Liberal MP for Hythe in 1859. He built Mentmore Towers in Buckinghamshire under the direction of Joseph Paxton, the most sumptuous of the English Rothschild houses at the time. He was a keen horseman and a member of the Jockey Club as well as owning his own stud farm. The fine collection of precious objects you have, have been obtained in consequence of the disasters of the royal family of France and the misfortune of others connected with them and if not purchased at the time they ....could never have been obtained and I am sure you well remember how often we have consulted as to how you would like each room decorated. Joseph Paxton was the architect engaged by Baron Mayer. He was regarded as the `new Christopher Wren'. He chose the `Jacobean ' style for the house taking as his model Wollaton Hall, outside Nottingham. The novel feature of Mentmore was the vast central hall covered with a forty-foot high glass roof and the interior was described as ` a stunning circumvention of cosiness'. The interiors dazzled contemporary visitors and Lady Eastlake wrote after a visit` I do not believe that the Medici were ever so lodged at the height of their glory'.